Fully deserving of mention in the same breath—or gasp—as Seven, Mystic River, and Zodiac, Prisoners' fragmented central mystery burns with white-hot intensity. Director Denis Villeneuve and writer Aaron Guzikowski weave a dense narrative web of seemingly disparate plot strands interwoven around a complex moral core; the movie is concerned with the psychological, emotional and social consequences of violence as much as solving the crime. The wages of sin, guilt, vengeance and redemption weigh heavily on the characters of Prisoners. With remarkable visual elegance and economy, the gifted Quebecois director flawlessly captures the moods and mores of small-town, God-fearing America. “Our Father, who art in heaven, hallowed be Thy name. Thy kingdom come. Thy will be done, on earth as it is in Heaven.” These words open Villeneuve’s film, spoken over a wintry forest landscape, frozen in the icy late-autumn chill. The slow, creeping camera pulls back to reveal the barrel of a shotgun, pointed head on at a lonely deer. This is only the first of many images of predators pursuing their prey. “Always be ready,” Keller Dover (Hugh Jackman) tells his son (Dylan Minette) on their way home from the hunting trip, the deer securely placed in the bed of his truck. It seems Dover has made an art out of praying for the best and preparing for the worst. His basement is stocked with enough provisions and safety precautions to outstand nuclear holocaust— the film is deeply concerned with its character’s worse-come-to-worst reactions and the varied objects that line their basement walls. When worse come to worst for the Dovers, however, not all the gas masks, batteries, ammunition rounds and canned goods in the world could have prepared them. Keller and wife Grace (Maria Bello) live on a quaint blue-collar suburban street dotted with modest but comfy houses, a seemingly secure environment far enough away from the world’s ills and dangers. For Thanksgiving, they visit Franklin (Terrence Howard) and Nancy Birch (Viola Davis). As the adults eat, drink, and relax, Dover’s six-year-old daughter and the Birch’s seven-year-old ask permission to go for a walk. They never return. Assigned to the case is Det. Loki (Jake Gyllenhaal), a sensitive but skeptical cop with no hint of an off-duty life, a twitchy, tic-laden manner and haunted—and haunting—gaze. The character, with his solemn demeanor and subtle suggestions of private sorrow and rage, anchors the film and provides a human, humane filter for the information presented onscreen. Take Gyllenhaal’s eager, energetic would-be-sleuth in David Fincher’s Zodiac and this world-weary, dogged detective, who would have been at home in a classic film noir, and the actor’s impressively broad dramatic range comes into sharp focus. Suspicion for the girls’ abduction falls on the driver of a run-down R.V. who was loitering around the neighborhood earlier that day, the faint sound of the radio suggesting someone was inside the camper, patiently watching the children—and Prisoners is a movie that knows a thing or two about patience, and about the disconcerting feeling of being watched. The R.V. 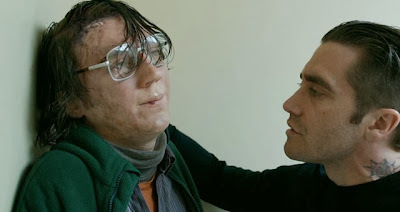 is soon found along with its owner, Alex Jones (played to creepy perfection by Paul Dano), who lives with his aunt (Melissa Leo) in the kind of battered, cluttered tract house that has accommodated many a serial killer, kidnapper, and other deviants of movies past. One look at the gangly, inarticulate, apparently mentally unstable man-child and we’re convinced of his guilt. The police are not so sure, and, without any physical evidence tying him to the crime, are forced to let him go. This is when the tally of kidnappers jumps to two. Keller, as confident as the audience that Alex is responsible for his daughter’s disappearance, abducts the suspect and imprisons him in an abandoned apartment building his father used to own. Keller’s unrelenting determination to find his little girl takes him and the movie to dark, violent and visceral places. When I related this to a friend who hadn’t seen the film, she was sure I had told her the entire plot. As I said to her: not even close. The puzzle of Prisoners is just starting to assemble itself, and constantly scrambling, shifting, and rearranging the pieces into semblances of a coherent image is one of the film’s greatest pleasures. False leads, false hope, and shadowy connections proliferate. Seemingly unrelated crimes are unearthed, new characters are introduced along with whole new sets of suspicions, and insignificant actions, gestures and snatches of conversation resurface later on to reveal their true importance. Without betraying the flow of the rich, naturalistic world he’s created and the credible, multi-dimensional characters that inhabit it, Guzikowski’s brilliantly twisty script piles on revelation after revelation, each one redefining the dynamic of the film’s universe in stark and shocking ways. A thorny moral debate on right and wrong bubbles under the suspenseful surface and gets under our skin without ever becoming sermonizing, simplistic, or self-conscious. Nothing is belabored, and nothing, in the end, is spelled out; take away from it what you will. 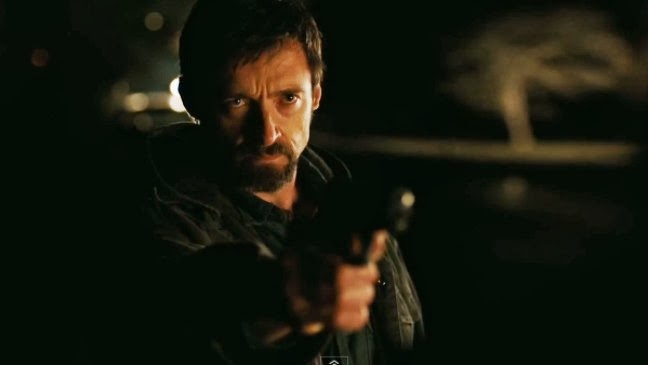 Jackman’s character is essentially doing what he thinks is right. He’s a true believer forced to question his beliefs, and the Australian actor projects a rugged Americanness easy enough to recognize; he’s the man of the house and protector of his family. But is this enraged, grief-addled mess an honorable man doing dishonorable deeds or a weak man trying to feel powerful? Is truth the only thing he’s hoping to extract, or is it perhaps also some measure of justice? Is there such a thing as righteous brutality? It’s horrifying to witness how certainty can override doubt by sheer force, and how doubt is often necessary to maintaining our humanity. Villeneuve never compromises the integrity of the human drama, managing to create an adult thriller that subverts some of the conventions of the genre in surprising, at times devastating ways. Lofty, clear-cut notions of right and wrong, innocence and guilt, have no place in this rain-sodden, middle-country American Dream gone bad; these conceptions are complicated by pain and uncertainty at every turn, and Villeneuve taking the time to include incidental scenes deepens both the characters and our understanding of them. I would say the two and a half running time flies by, not a frame wasted, but flight seems a somehow incorrect descriptor for a movie that sustains agonizing, almost unbearable tension throughout. Most of the events take place in a single week, but our perception is that time inches along at the specific pace that sets in during a crisis, when each passing, pressing moment stretches boldly and despairingly towards infinity. 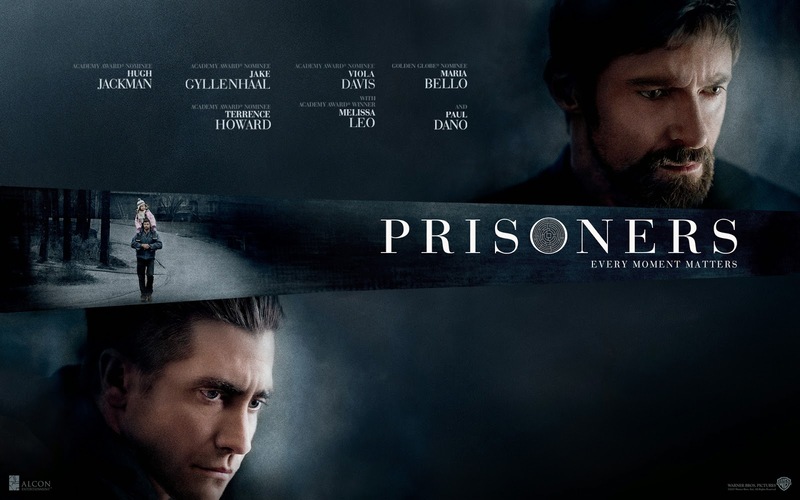 Johann Johannsson’s score hits all the right, hauntingly mournful notes, and master cinematographer Roger Deakins turns Prisoners into a visually stunning study of grays and browns, dead leaves and bare trees under a laden, lead-colored November sky. Cold, cheerless blues and blacks are used to almost expressionistic effect, and the movie becomes as grim and gloomy as the human condition, and just as likely to present, against all odds, a faint glimmer of hope, as small but potentially life-changing as the muted sound of a whistle in the silent night. This is a spellbinding, sensational, searing thriller the kind Hollywood doesn’t make very often—you know, the kind that not only has something to say but is eloquent enough to say it. Villeneuve’s film has quite a lot to say, in a measured, quiet tone that masks supreme confidence. Its unflashy assurance absorbs and controls you for the duration, making you a willing captive of Villeneuve’s Prisoners. The movie is at times hard to watch, but it’s even harder to shake off.